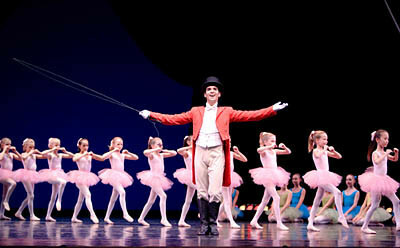 Jonathan Porretta and PNB School students in Circus Polka. The 2006 Pacific Northwest Ballet premiere of Jerome Robbins’ Circus Polka was generously underwritten by Marcella McCaffray. Balanchine’s ballet for “Fifty Elephants and Fifty Beautiful Girls” was performed 425 times. In 1972, Jerome Robbins created a new ballet to Stravinsky’s music, this time for 48 young dance students and a Ringmaster. Robbins’ short ballet ends with a floor pattern that spells out either the composer’s initials, I.S., or another anagram or number befitting the particular occasion.